Cold Stone Creamery, Nigeria’s foremost ice cream brand is saying thank you to their customers with mouthwatering discounts at their Ikeja City Mall and Festac stores. 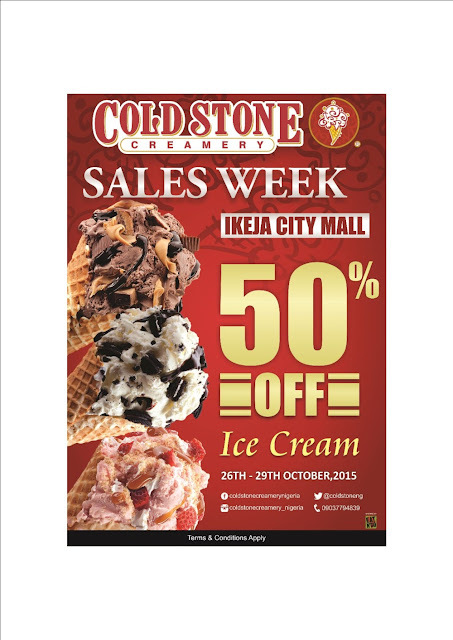 Get 50% OFF any ice cream purchase made at Cold Stone Creamery Ikeja City Mall from MONDAY, 26th of October - THURSDAY 29TH of October. Cold Stone is an international brand with over two decades of selling premium, great tasting ice cream globally (over 3 years in Nigeria). As their brand promise suggests, it’s not just another ice cream, it is the “Ultimate Ice Cream Experience”.